Amazon unveiled the latest product coming out of its secretive Lab 126 R&D subsidiary Thursday: Echo is a connected loudspeaker that doubles as a smart assistant, thanks to seven integrated microphones that are used for voice input. And here’s the twist: Echo doesn’t just take voice commands around the music and radio programs. Instead, it’s much closer to Apple’s Siri or Google Now, allowing users to compile shopping lists, read weather reports, set alarms and reminders and even read Wikipedia articles. Echo is retailing for $199, and Amazon is making the speaker available to Prime members for just $99. However, consumers interested in Echo have to get in line: Amazon is selling the product via invitation only. The YouTube ID of KkOCeAtKHIc#t=37 is invalid. On the music front, Echo offers access to Amazon’s Prime Music subscription service as well as the Amazon Music cloud locker, iHeartRadio and TuneIn. That’s not a very long list, but Echo makes up for the lack of Spotify support by also allowing users to connect via Bluetooth, effectively playing anything that’s available on their mobile phone. 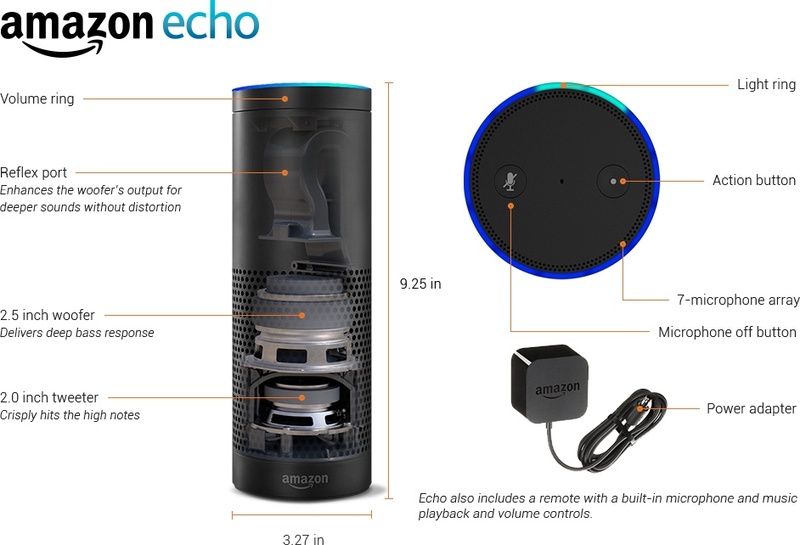 Echo’s seven microphones are supposedly capable of taking voice commands from across the room even while the music is playing, but Amazon is also including a remote control with an integrated microphone just in case. The microphones are always on, but not always listening — the device is using the same kind of hot word technology that’s also being used by Microsoft’s Kinect or Motorola’s Moto X, all of which constantly listen to a certain key word and then kick into full gear as soon as they’re prompted. And as a bonus, Echo has a button to mute the mic. Echo’s smarts are powered by Amazon’s web services, and the company promises that the device will learn from its users over time. And this type of learning isn’t just limited to the loudspeaker itself: Amazon is also releasing Echo apps for its Fire phone as well as its Kindle Fire tablets, Android and iOS phones and tablets as well as computers to make Echo’s to-do lists and other services available across platforms. There’s no word yet on whether these apps will be available to users who don’t have the device, but I’d assume that Amazon will at least initially tie them to hardware ownership. There have been efforts to build these kinds of smart assistants for your home before. The Ubi aims to be a kind of intercom for the smart home, and the Aether speaker aims to combine cloud music streaming with voice input. However, Amazon’s strength is that it could combine Echo with its other devices and services to make it a lot more valuable out of the box. The way Echo ties in with other Amazon devices and products may be key to why Amazon decided to develop this type of smart connected speaker. Amazon’s Fire phone hasn’t taken off with consumers, and even the company’s Kindle Fire tablets struggle to keep up with iPads and increasingly larger Android phones, in part because Amazon’s own platform doesn’t have any killer apps that aren’t available on iOS or Android. A smart assistant that integrates into all parts of your life could be such a killer app, especially if it manages to become a communal device in a household that isn’t tied to one single user, or even handset. The title would lead one to believe that you can use voice commands to control the Sonos system with this new echo device. Obviously that’s not the case. Why the Sonos comparison? I don’t see that much similarity. A little late to the party Amazon…. My Ubi has been doing this kind of thing for over a year now. Linked to home automation, IFTTT, and a host of other features make it a very useful piece of technology. If the Echo will work with IFTTT, I would imagine Ubi would need to come down in price to remain competitive.